Descubre las 5 actividades en las que te debes enfocar para lograr tus metas. 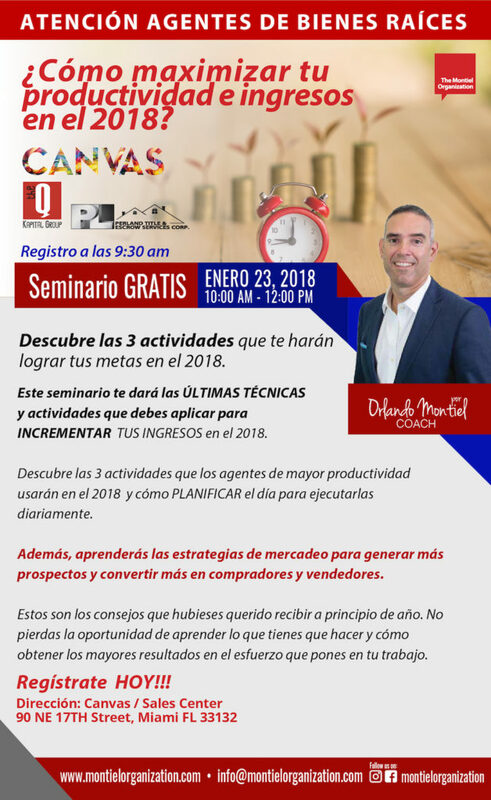 Este seminario te dará la CLARIDAD, SIMPLICIDAD Y ENFOQUE para duplicar tus ventas en el 2019. 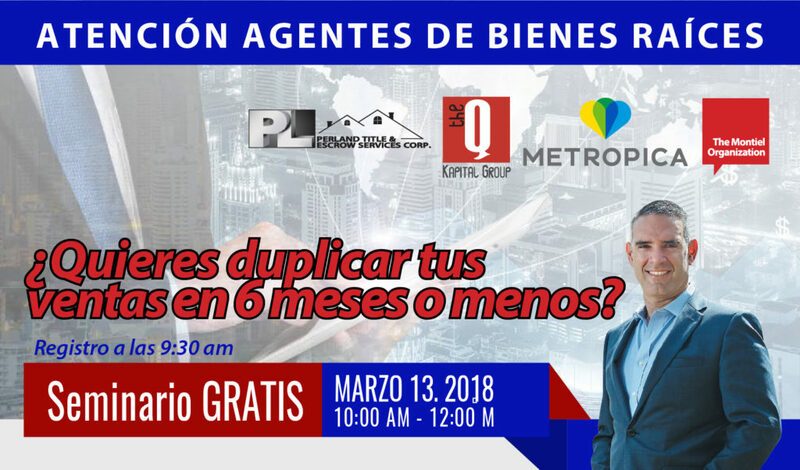 Aprenderás a identificar las 5 actividades que los agentes de mayor producción están usando hoy y como lograr simplificar el día para ejecutar diariamente. 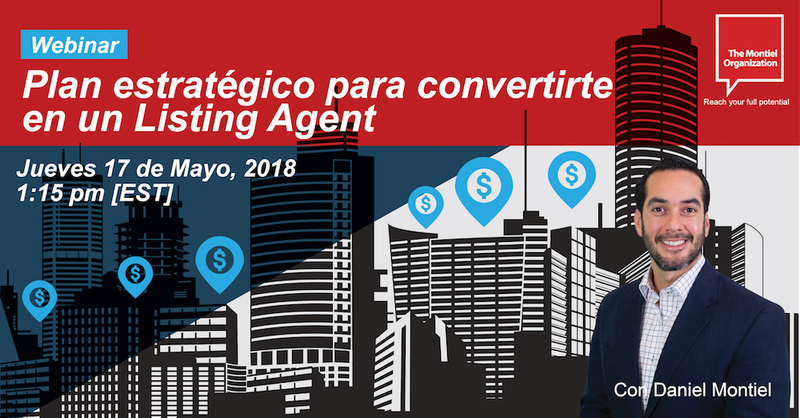 Además, aprenderás las estrategias de mercadeo para generar más prospectos y convertir más en compradores y vendedores. Estos son los consejos que hubieses querido recibir a principio de año. No pierdas la oportunidad de aprender lo que tienes que hacer y cómo obtener lo mayores resultados en el esfuerzo que pones en tu trabajo. 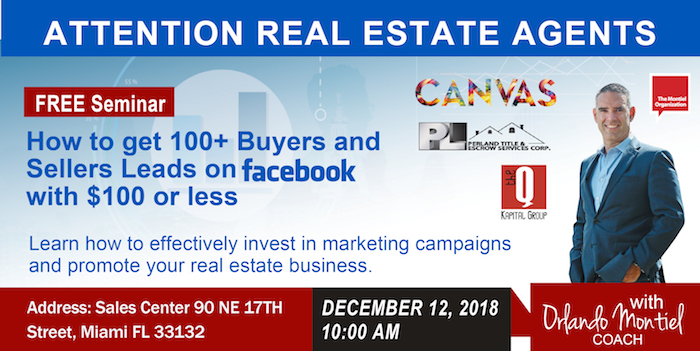 Learn how to effectively invest in marketing campaigns and promote your real estate business. • To analyze the results of your campaigns Boosting vs. ADS. Discover The 5 activities you need to double your income in 6 months or less. No pierdas esta oportunidad. Regístrate hoy! ¿Tienes una estrategia clara de mercadeo? 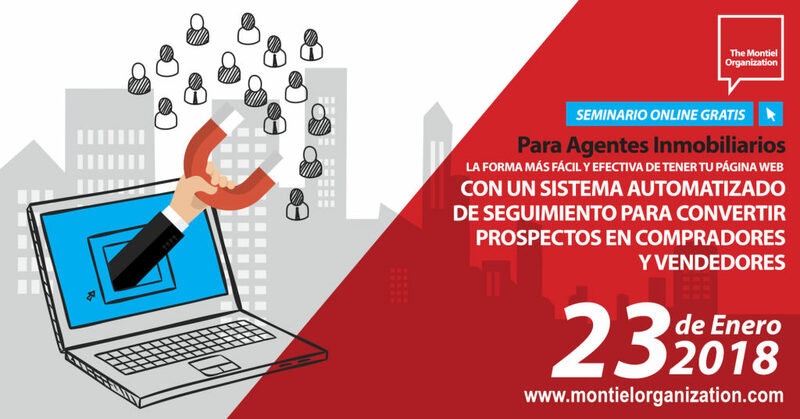 ¿Tienes un sistema de seguimiento que te permita posicionarte como el experto a elegir y convertir más prospectos en clientes? 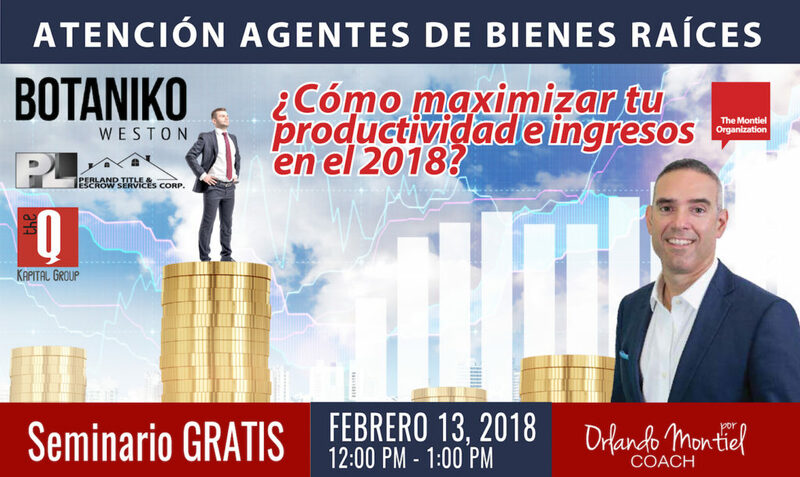 Asiste a este evento en vivo, donde descubrirás como construir y automatizar Paso a Paso el proceso de captación y conversión prospectos a clientes, AUTOMÁTICAMENTE sin ningún conocimiento técnico! 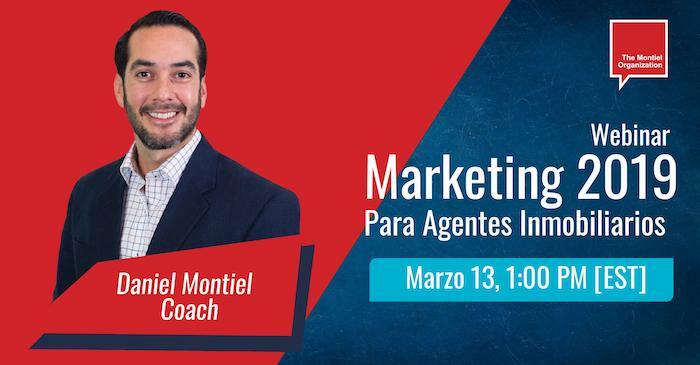 Este seminario te dará la CLARIDAD, SIMPLICIDAD Y ENFOQUE para duplicar tus ventas en menos de 6 meses. Do you have a marketing strategy for the first quarter of 2019? Do you know how to generate more prospects? Do you have a follow-up system to convert more prospects into clients? How to automate, step by step, the LEAD CAPTURING & LEAD CONVERSION process of your real estate business without any technical knowledge. Real estate agents do a lot of things but nothing is more important than LEAD CAPTURING & LEAD CONVERSION. MASTER LEAD CAPTURING AND LEAD CONVERSION AND START 2019 ON THE RIGHT FOOT!!! 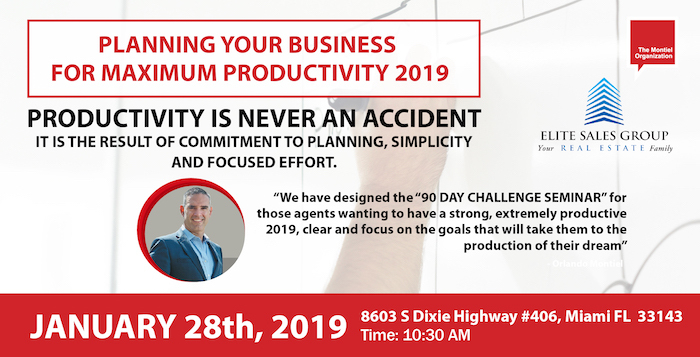 The “90 DAY CHALLENGE SEMINAR” was designed to create massive momentum by helping you identify what it is you really need right now in your business, whether you are new or experienced agent to have an amazing quarter. • How to generate weekly prospects with minimal investment. • How to manage your campaigns and more. REGISTER AND LEARN IT TODAY!!!! 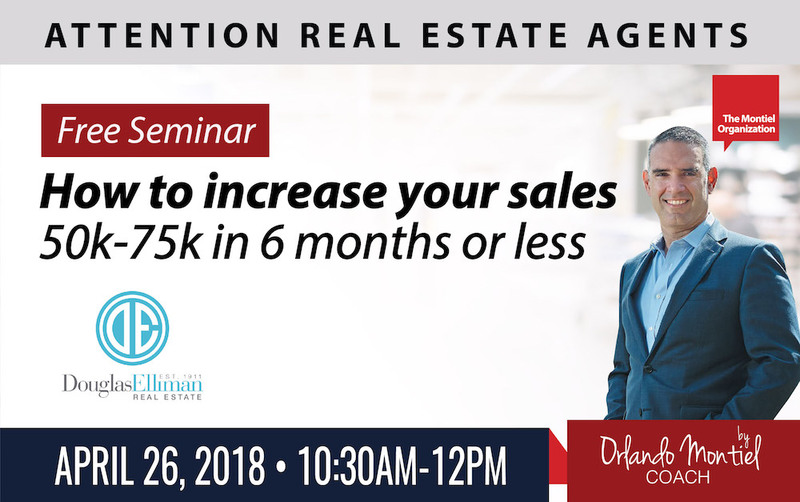 This seminar is specifically designed for the 2018 Real Estate Market in South Florida. The real estate market has changed. Many real estate agents have depended on Pre-Construction Sales to make a living, however, is not as easy to sell pre-construction as it used to be. The 5 factor that determine how successful you will selling pre-construction projects 2018. The 7 mistakes real estate agents make when selling pre-construction. How to present a pre-construction project to a potential buyer in less than 15 minutes. 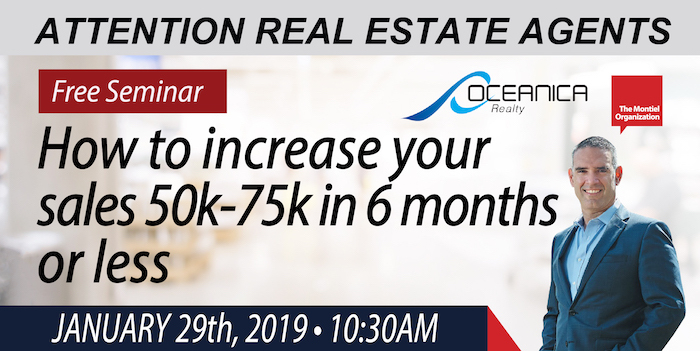 How to create an effective e-mail marketing campaign to convert potential prospects into actual pre-construction buyers. How to answer objections from pre-construction buyers. 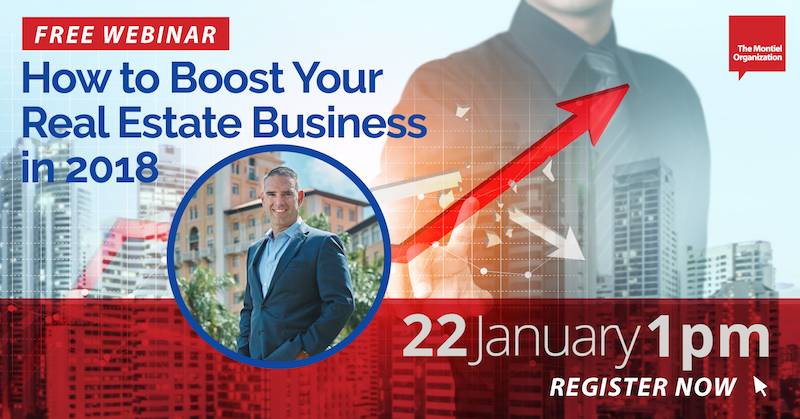 Register now and learn how to make pre-construction a profitable business model in your real estate practice. Do you have a marketing strategy for the last quarter of 2018? MASTER LEAD CAPTURING AND LEAD CONVERSION AND FINISH 2018 STRONG!!! It is not enough to know how to generate leads, you need to know how to convert them into clients, in other words, you need to know how to HANDLE OBJECTIONS. Learn how to handle the 8 objections so you can close more leads. 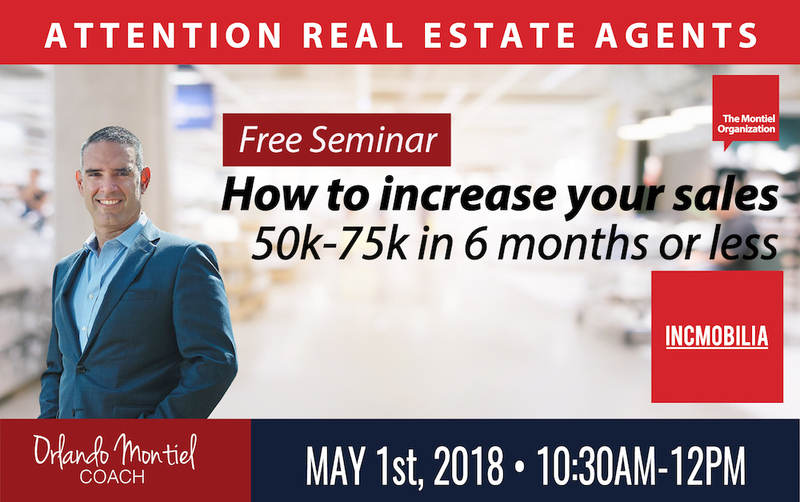 This is the most practical real estate seminar you will ever attend. 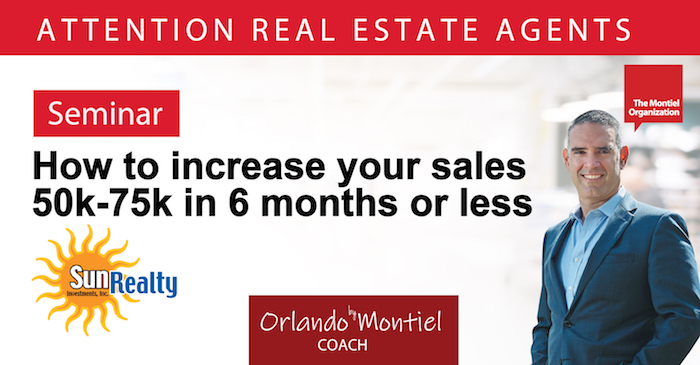 EVERY AGENT MOST DEVELOP THE ABILITY TO HANDLE EVERY SINGLE OBJECTION!!!! EXCLUSIVE FOR MACKEN REAL ESTATE AGENTS!!! 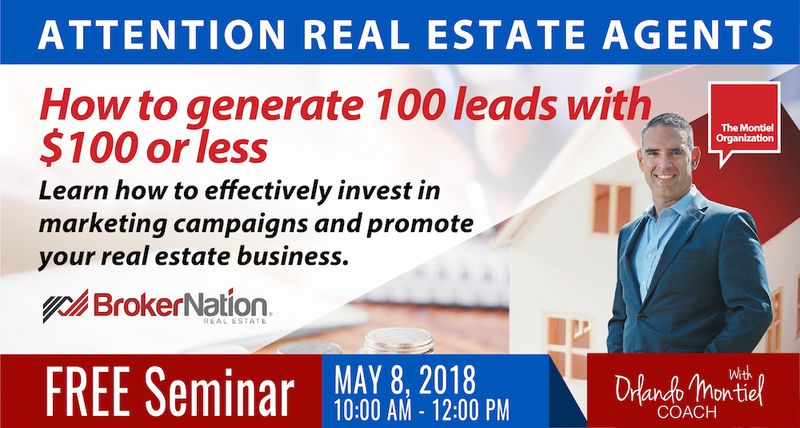 Don’t miss this seminar where you will discover step by step how to maximize a real estate website and email marketing campaign for maximum lead generation and conversion. Stop wasting time with your website and emails that are not getting you any real results and start converting now. 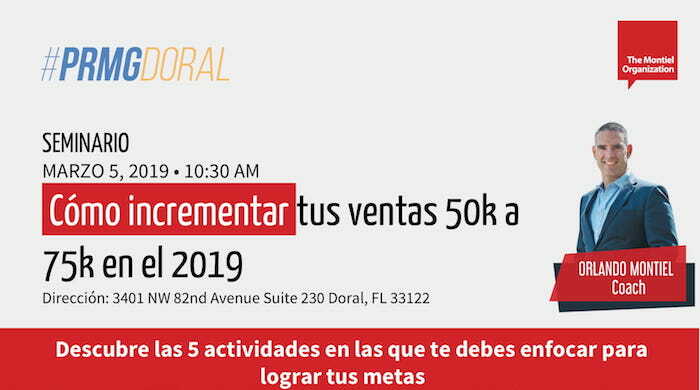 EL Mercado inmobiliario en Miami ha cambiado, un gran número de agentes depende de la venta de pre-construcciones para sustentar su negocio inmobiliario pero ya no es tan fácil como lo era en el 2015 o 2016. The real estate market has changed. Many real estate agents have depended on Pre-Construction Sales to make a living, however is not as easy to sell pre-construction as it used to be. • The 7 mistakes real estate agents make when selling pre-construction. • How to present a pre-construction project to a potential buyer in less than 15 minutes. 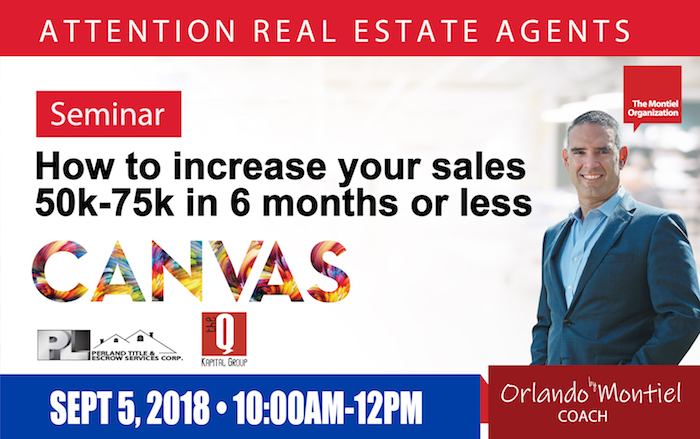 • How to create an effective e-mail marketing campaign to convert potential prospects into actual pre-construction buyers. • How to answer objections from pre-construction buyers. Learn how to close more deals and stay ahead of your competition. The difference between your are you competitor is Knowledge. Do you work with out-of-town buyers or foreign nationals? Then, this is a ‘MUST ATTEND” seminar. Miami is a city that is going through an incredible transformation and growth. We all know it. 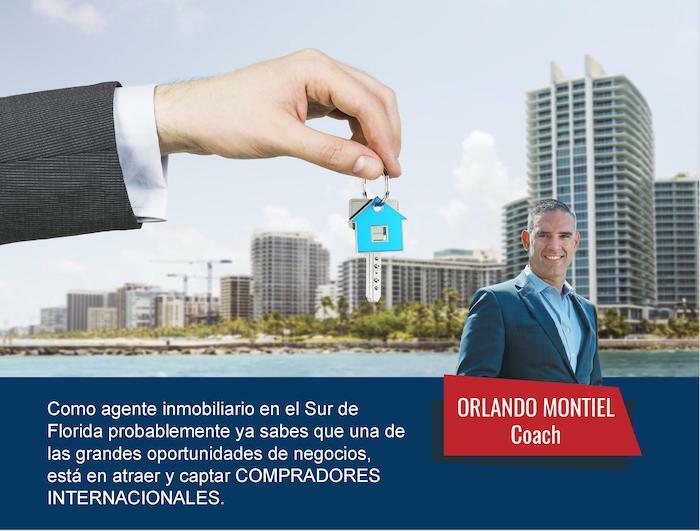 However, what are the key factors that will maintain Miami in the leading edge of real estate and how can you have the competitive advantage among so many agents when selling properties in this wonderful city? 1. Acquire the knowledge to really excel in this real estate market. 2. Develop the confidence to qualify and talk to your clients. 3. Make an amazing presentation to your potential buyers and investors. Aprende a Capturar y Convertir Prospectos en Compradores y Vendedores. Las 6 Cosas Que Necesita Tu Pagina Web para captar potenciales clientes. 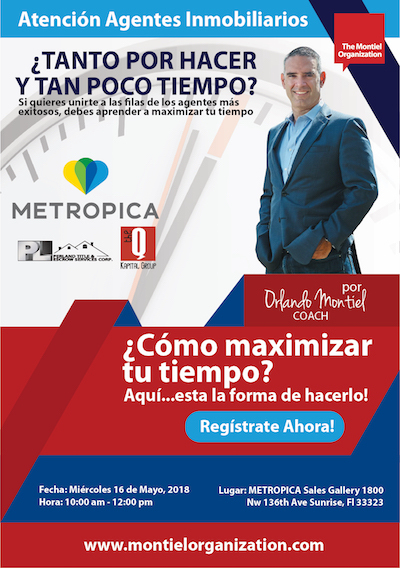 NO TE PUEDES PERDER ESTE ENTRENAMIENTO!!!! Deja de vender como si fuese 1985 y comienza a utilizar las herramientas más poderosas de mercadeo en el Segundo Semestre del 2018. 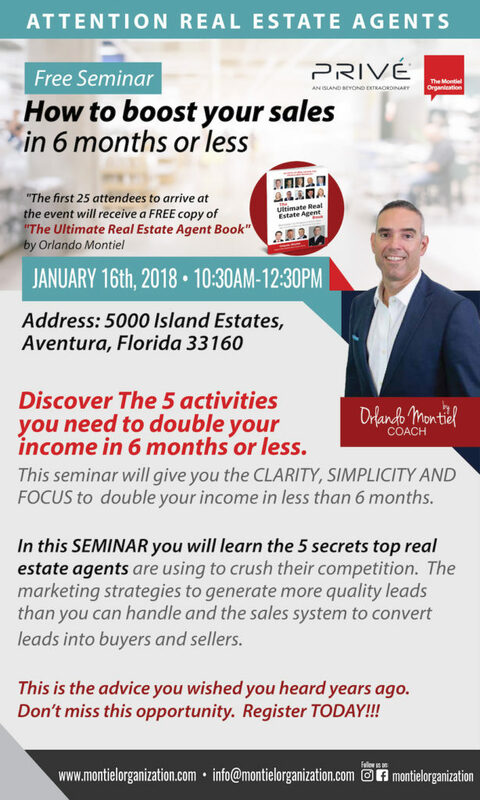 This seminar is specifically designed for agents trying to get their income to 6 figures. Not enough time during the day? Feeling that you have the potential to make more money but don’t know how? Discover The 5 activities you need to do in 2018 to increase your income 50k-75k in 6 months or less. Can you do more than these 5 things, absolutely, should you? Definitely NOT. 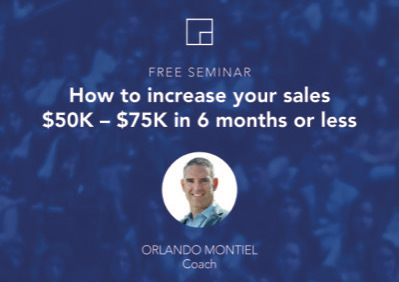 This seminar will give you the CLARITY, TIME AND FOCUS to increase your income $50,000-$75,000 in 6 months or less. The marketing strategies to generate more quality leads than you can handle. The system to convert leads into buyers and sellers. The organization skills for maximum productivity. 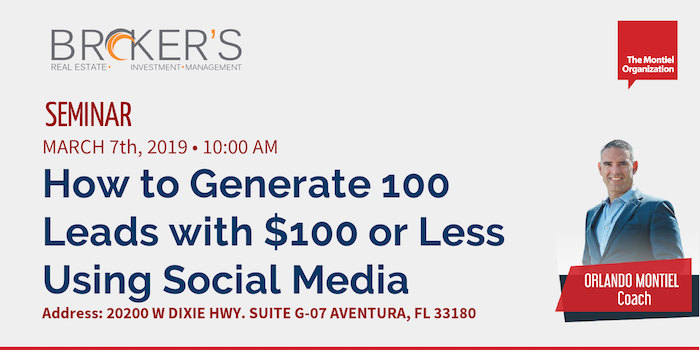 If you are looking to increase the number of lead, convert more leads into clients and organize your day for maximum productivity, this seminar is for you. This is the advice you wished you heard years ago. Don’t miss this opportunity. 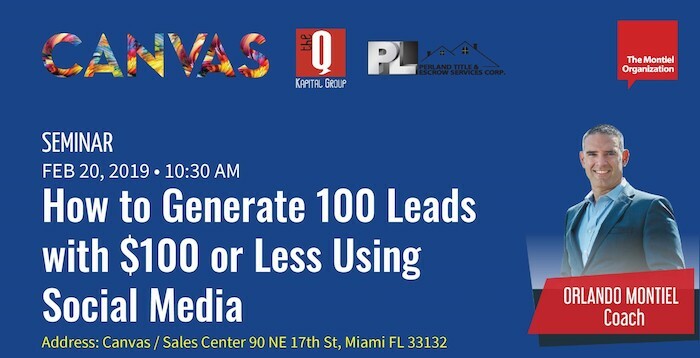 Learn how to use social media to generate qualified prospects in LESS THAN 24 HOURS!!! Start generating qualified buyers and sellers leads and increase your income TODAY!!! 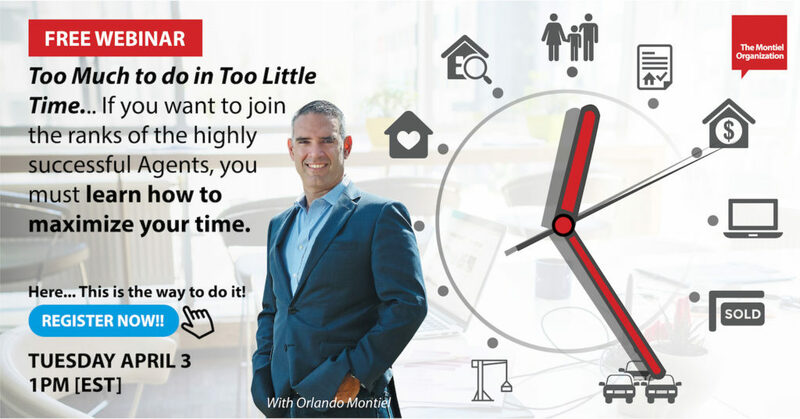 – Not enough time during the day? – Feeling that you have the potential to make more money but don’t know how? – The marketing strategies to generate more quality leads than you can handle. – The system to convert leads into buyers and sellers. – The organization skills for maximum productivity. 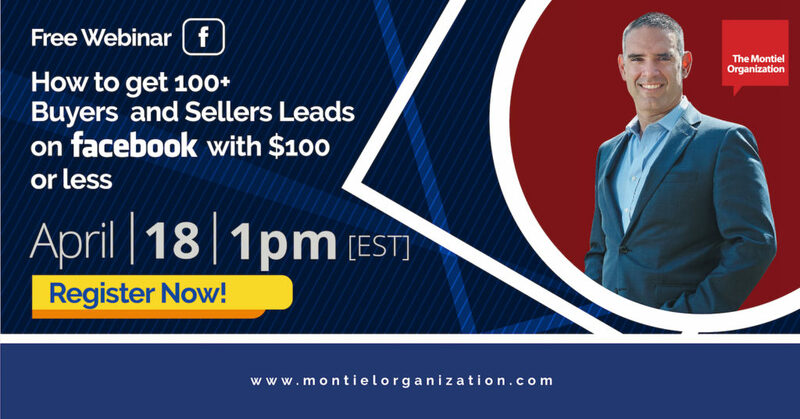 How to get 100 leads with $100 or less in a Week GUARANTEED! 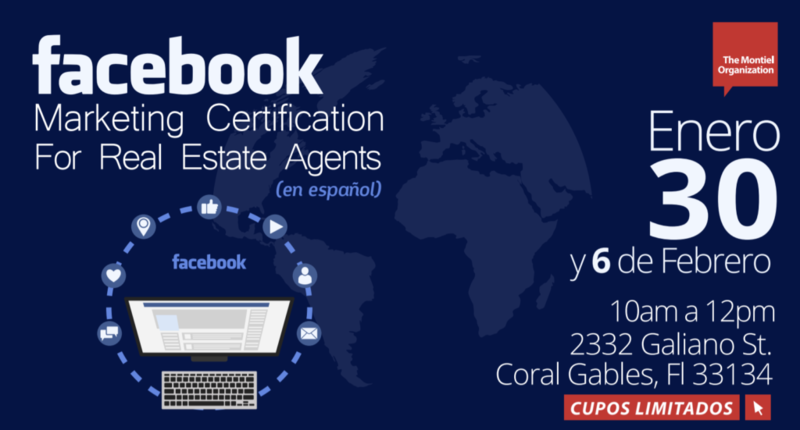 Real Estate Agent, Do you want to know How To Make Money on The World’s #1 Social Network? 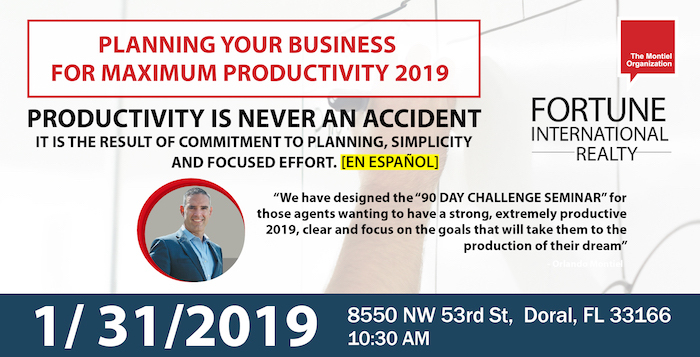 Click below to get access to this 60-minute jam-packed session. 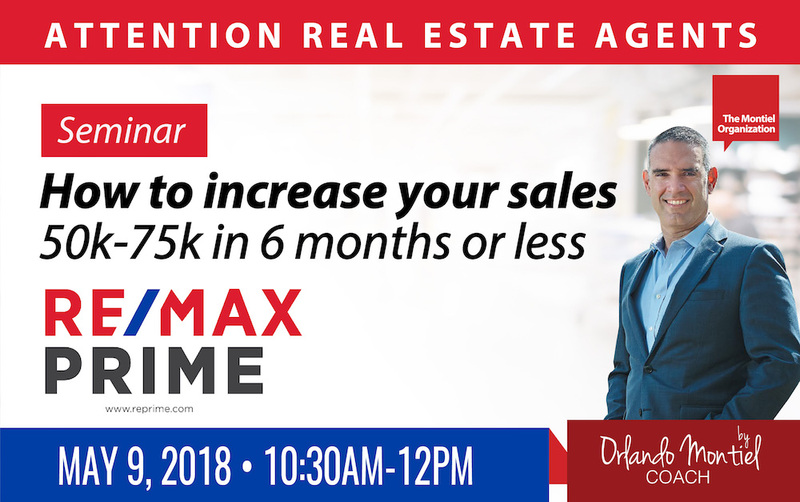 So far this session is one of the most well-received trainings within your real estate network. How to effectively invest in marketing campaigns and promote your real estate business. How to generate weekly prospects with minimal investment. How to choose the right audience for your business. The Split Test as a conversion strategy. The different objectives of an AD campaign. To analyze the results of your campaigns. How to manage your campaigns. How to create campaigns from Facebook to Instagram. The importance of the “Facebook Groups”. Why is vital to add downloadable products in your marketing campaigns. The ideal budget and scope of a campaign. PLUS, along with tons of useful content, We’ll have bonuses, live Q&A session! 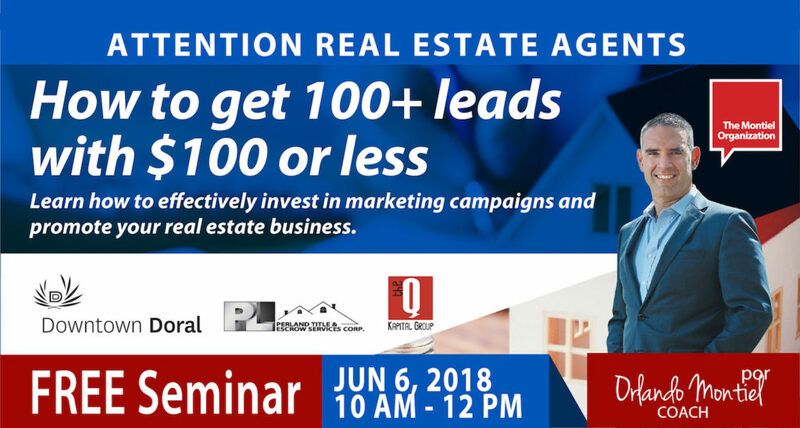 Learn how to efectively invest in marketing campaigns and promote your real estate business. The diferent objectives of an AD campaign. To analyze the results of your campaigns. Boosting vs. ADS. 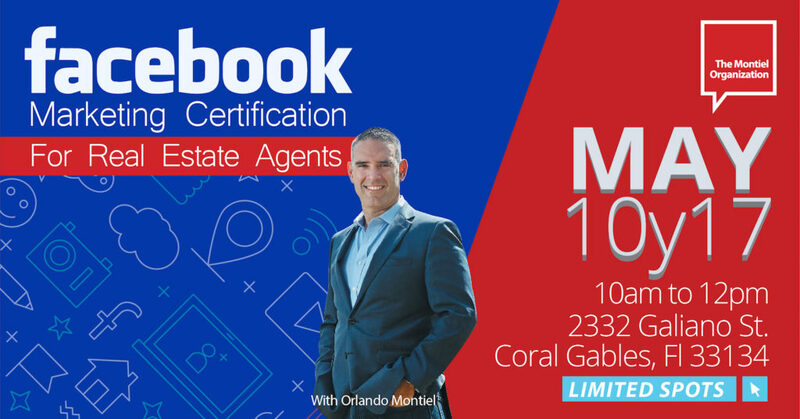 Join us for our never before live show with two special guests , Alex Vidal , President of Related ISG International Realty and Craig Studnicky , President and Principal of ISG World. 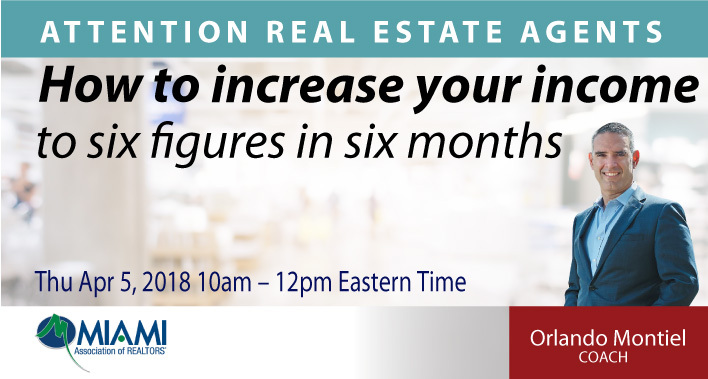 Learn the latest techniques to build a successful real estate business and the current trends in the Miami Real Estate Market, featuring the 2018 Miami Report. • How to choose the right audience for your business. • The Split Test as a conversion strategy. • The different objectives of an AD campaign. 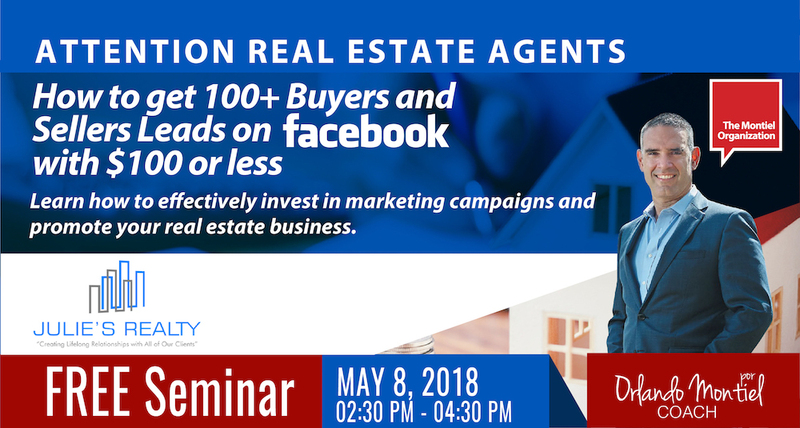 Do you know how to use FACEBOOK to market your real estate business and attract buyers and sellers in a constant way? Do you know what kind of information to publish? Let’s be honest, Do you have a clear strategy? Have a Business Page/Fan Page. Have performed at least 9 publications. Be familiar with the facebook tools. 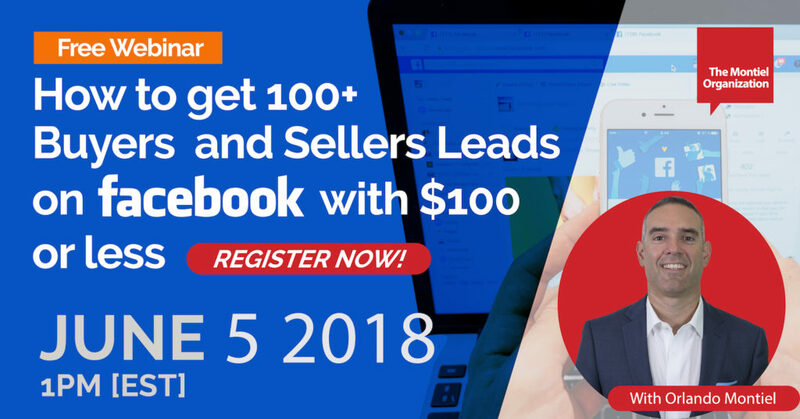 If you want to know How To Make Money On The World’s #1 Social Network, you need to come to this certification. ¿Tanto por hacer y tan poco tiempo? 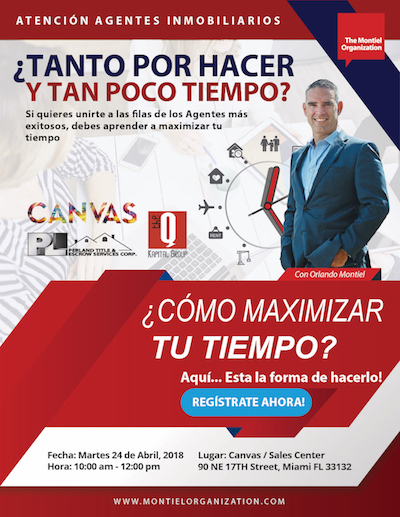 Si quieres unirte a las filas de los Agentes más exitosos, debes aprender a maximizar tu tiempo. En este seminario encontrarás la forma de hacerlo. Si alguno de estos te aplica, ¿Adivina Que? 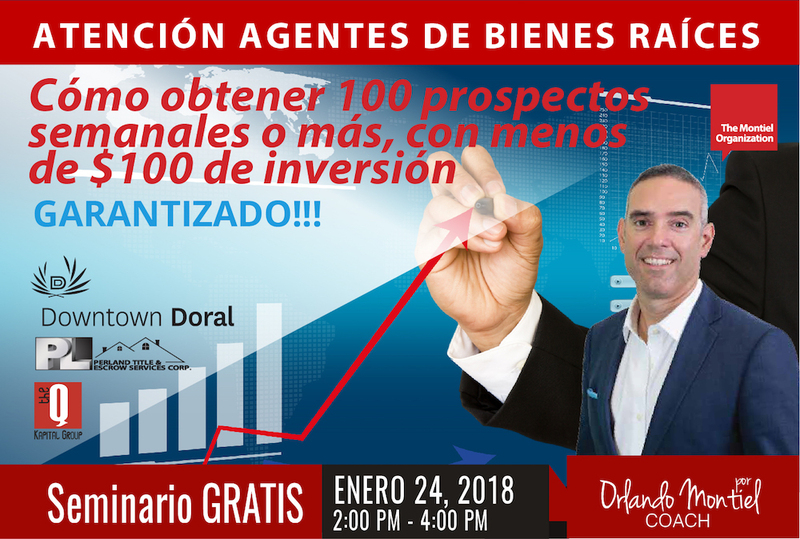 Asiste a este Entrenamiento Online totalmente Gratis, donde descubrirás paso a paso el proceso para convertirte en un LISTING AGENT! 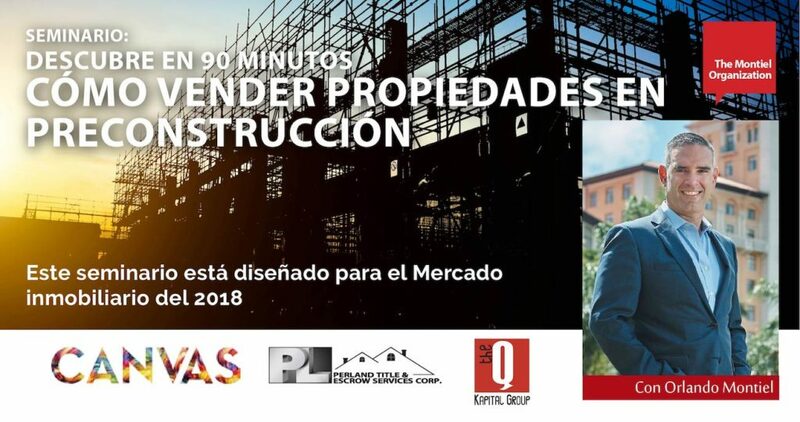 SEMINARIO Como obtener 100 prospectos semanales o mas con menos de $100 de inversión. GARANTIZADO!!! 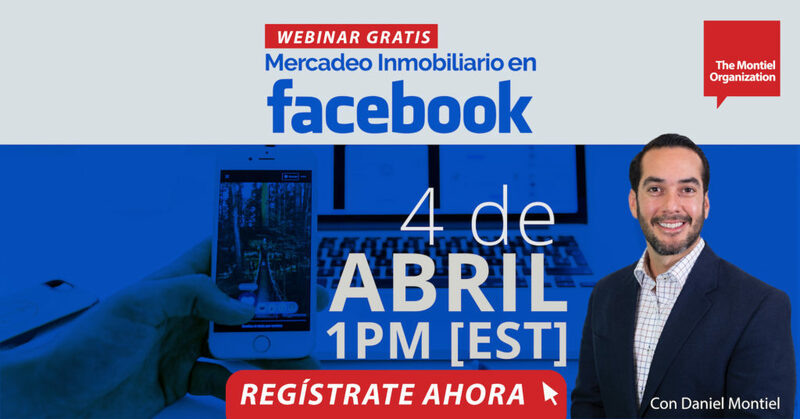 Aprende a utilizar las redes sociales para generar prospectos calificados en menos de 24 horas. 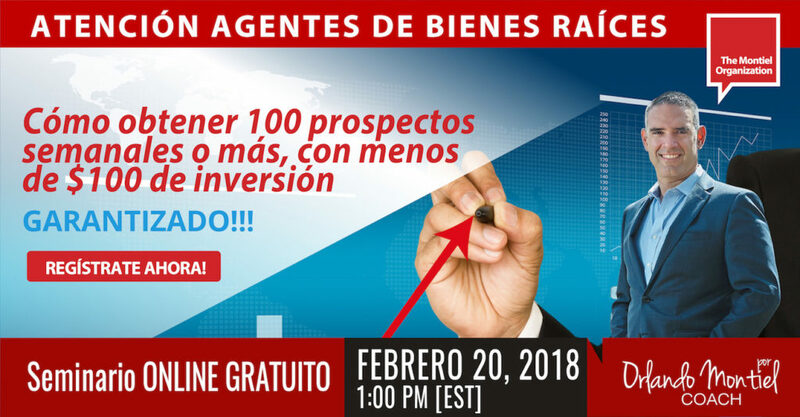 Comienza a generar 100 prospectos semanales con $100 o menos e incrementa tus ingresos HOY!!! 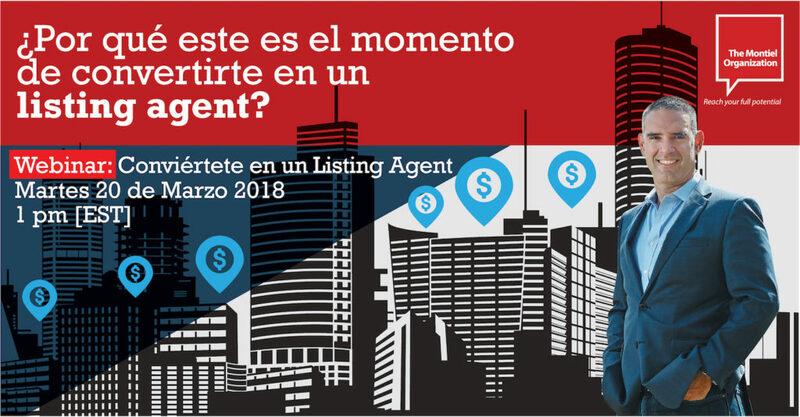 convertirte en un Listing Agent? 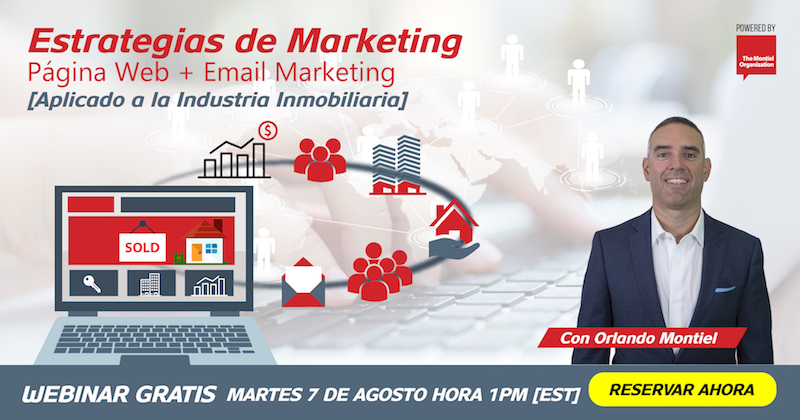 Asiste a este Seminario totalmente Gratis, donde descubrirás paso a paso el proceso para convertirte en un LISTING AGENT! 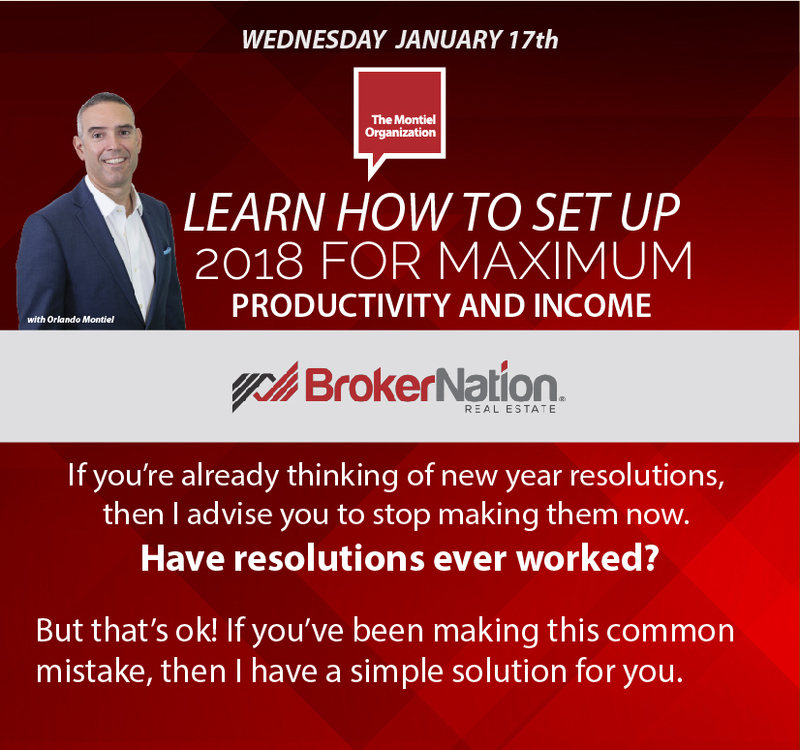 ​​​​​​​Now that we’re starting a new quarter Q2 of 2018, Learn the 3 simplest things that you need to do in the next 90 days to maximize your productivity & income… IF you want to join the ranks of the highly successful agents. 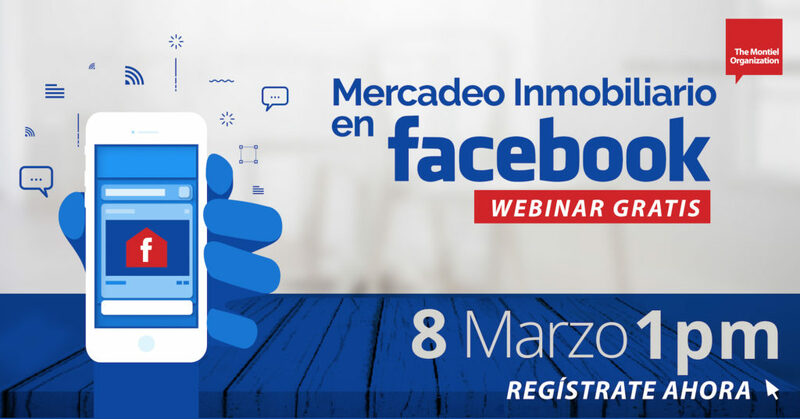 ¿Sabes cómo utilizar Facebook como herramienta para mercadear tu negocio inmobiliario y captar nuevos clientes de manera constante? 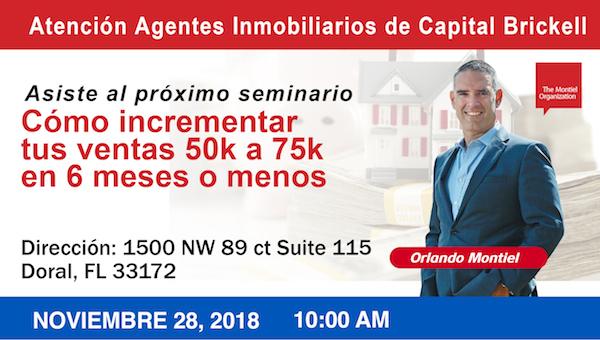 Generar prospectos semanalmente con mínima inversión. Evitar los errores más comunes al usar Facebook. 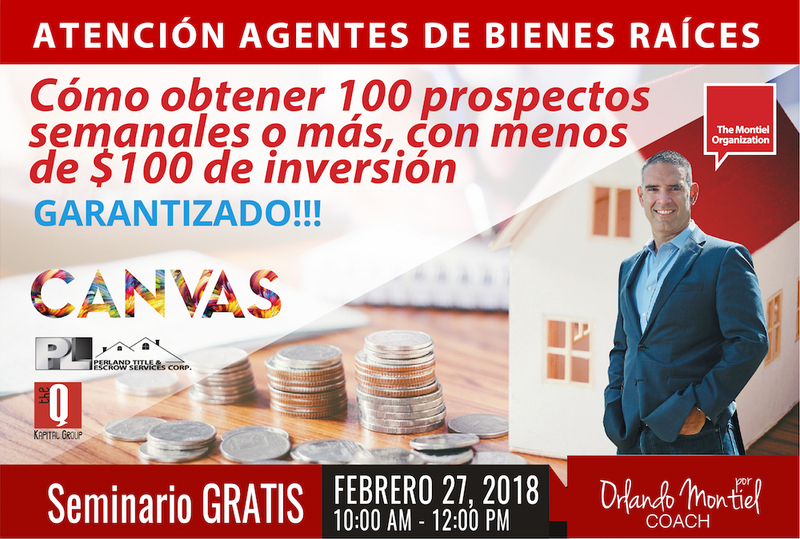 Convertir más prospectos en clientes. Posicionarte como experto en la mente de tus clientes. 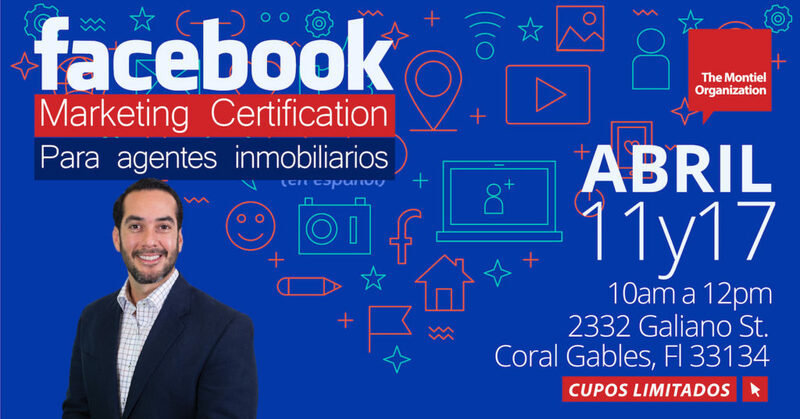 Tienes que asistir en vivo a este entrenamiento online, donde descubrirás como utilizar FACEBOOK como herramienta para mercadear tu negocio inmobiliario, aprendiendo paso a paso el proceso de captación y conversión! 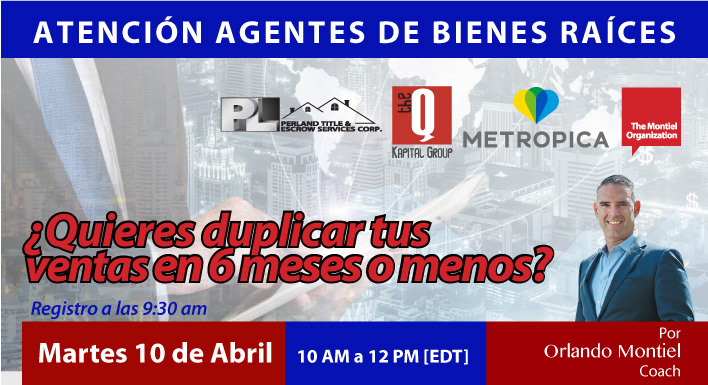 ¿Quieres duplicar tus ventas en 6 meses o menos? ¿Sabes qué tipo de información publicar? Honestamente, ¿Tienes una estrategia clara? Si tu respuesta es “NO” a alguna de estas preguntas, no te puedes perder este entrenamiento. 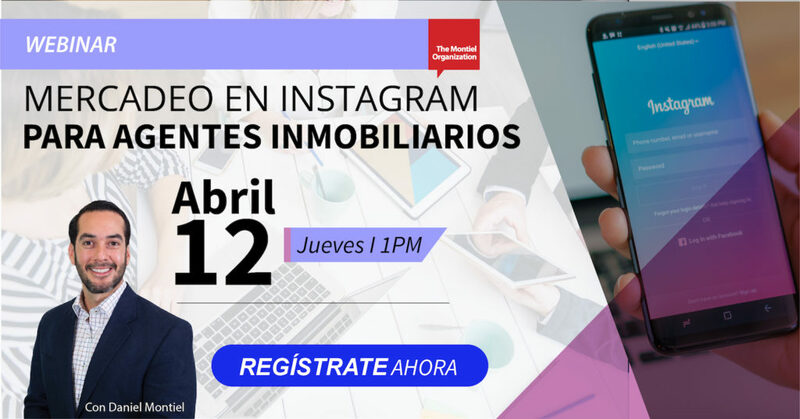 ¿Sabes cómo utilizar Instagram como herramienta para mercadear efectivamente tu negocio inmobiliario y captar nuevos clientes de manera constante? ¿Cuál es el mejor día y hora para publicar? Si tu respuesta es “NO” a estas preguntas , no te puedes perder este ENTRENAMIENTO VIRTUAL completamente GRATIS el Jueves 12 de Abril a la 01:00PM. ¿Cómo incrementar tus ventas 50k a 75k en 6 meses o menos? This class is presented in Spanish. 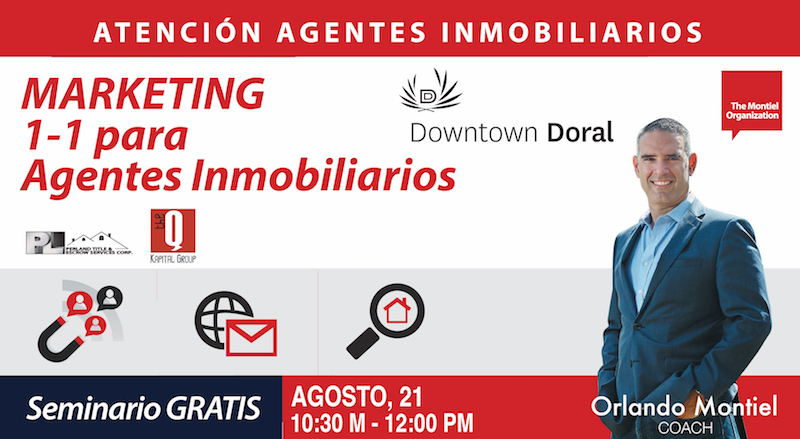 Quieres convertirte en un Listing Agent? 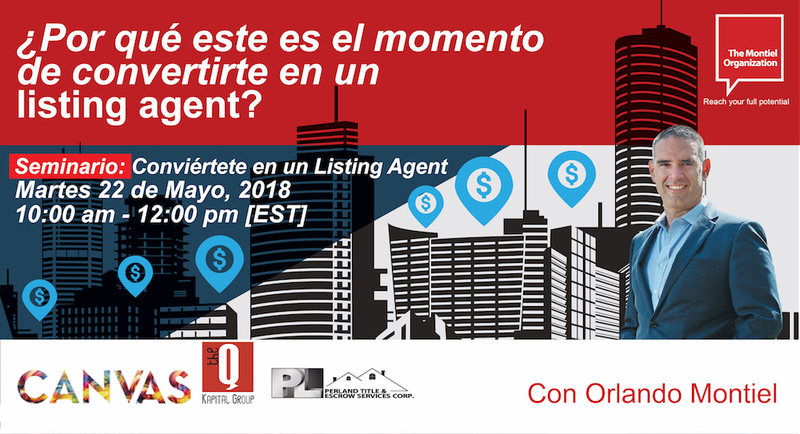 Seguramente has escuchado la frase “In order to last you need to list” lo que significa que para perdurar en el tiempo debes posicionarte como Listing Agent. ​​​​​​​+ Que información enviar? Con qué frecuencia? ​​​​​​​+ Que sistemas utilizar para enviar la información? ​​​​​​​+ Cómo determinar el costo de mercadeo a través de postcards ó cartas? ¿Cómo maximizar tu productividad e ingresos en el 2018? Descubre las 3 actividades que te harán lograr tus metas en el 2018. 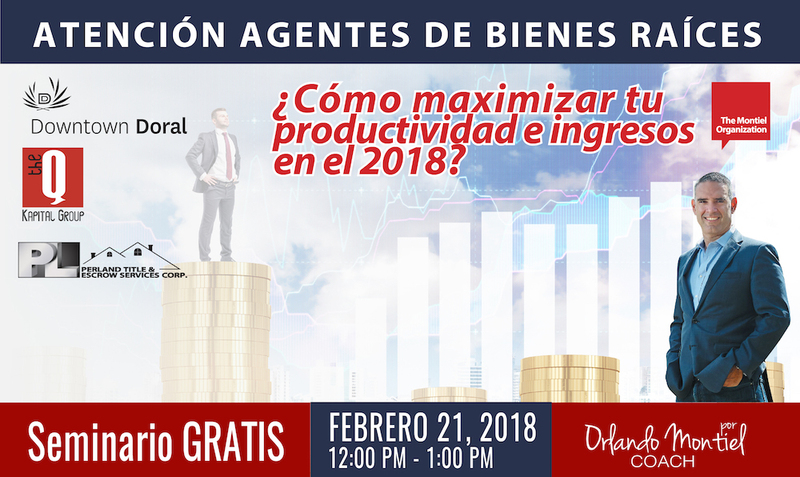 Este seminario te dará las ÚLTIMAS TÉCNICAS y actividades que debes aplicar para INCREMENTAR TUS INGRESOS en el 2018. 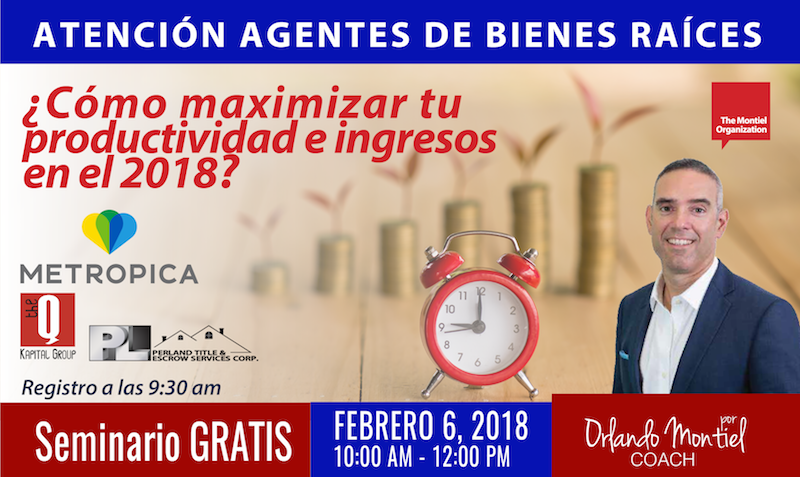 Descubre las 3 actividades que los agentes de mayor productividad usarán en el 2018 y cómo PLANIFICAR el día para ejecutarlas diariamente. Estos son los consejos que hubieses querido recibir a principio de año. No pierdas la oportunidad de aprender lo que tienes que hacer y cómo obtener los mayores resultados en el esfuerzo que pones en tu trabajo. Las redes sociales es una de las herramientas de mayor generación de prospectos y conversión a clientes. No es esto lo que estamos buscando? Comienza a generar 25 prospectos semanales (100+ al mes) e incrementa tus ingresos HOY!!! 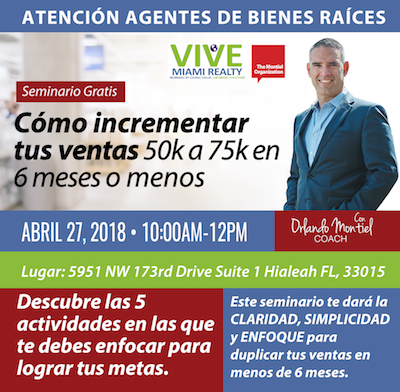 En este Entrenamiento Virtual encontraras respuesta a estas preguntas en un PLAN 100% aplicable a tu negocio HOY! 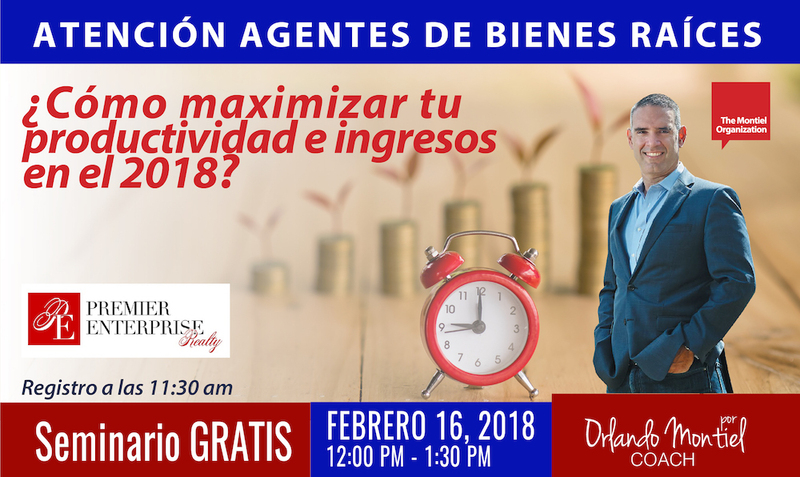 En este seminario encontraras respuesta a estas preguntas en un PLAN 100% aplicable a tu negocio HOY! If you’re already thinking of new year resolutions, then I advise you to stop making them now. Have resolutions ever worked? But that’s ok! If you’ve been making this common mistake, then I have a simple solution for you. 1. OBJECTIVE BASED: Annual plans tell you the WHAT to do but don’t specify the HOW in a weekly and more important DAILY basis so you can execute and reach your goals. As a result, there is not clarity, simplicity and focus. 2. LACK OF URGENCY: From January to December looks like a long way. While we’re certainly not pleased at the end of January, we’re not too worried, either, because we think to ourselves: “I’ve got plenty of time. 3. NO SUPPORT GROUP: Your chances of success are seven times greater if you employ peer support. Most agents work alone and from their home usually resulting in lack of discipline, discouragement, and frustration. “It’s not what you know; it’s not even who you know; it’s what you implement that counts. There is a big difference between knowing and doing. By consistently executing the critical, few tasks, that most support your success, you will be able to increase your income and productivity, all of this without working longer hours. · Double or triple their income just by consistently applying (executing) what they already know. Then this seminar is for you!!!! 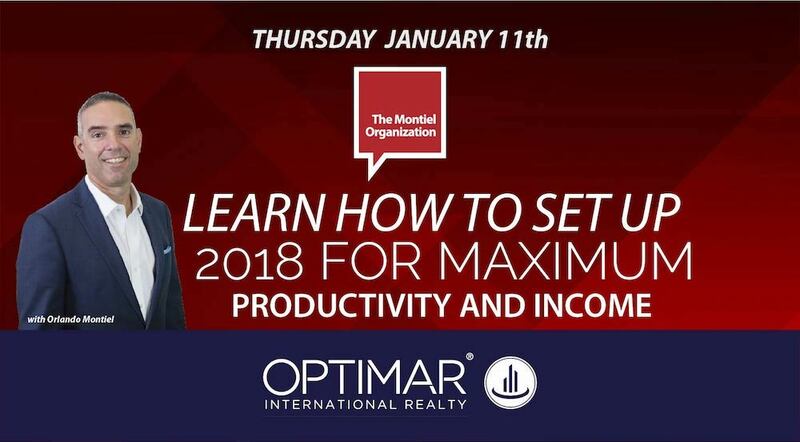 Join us Thursday January 11th at the Optimar Sunny Isles office from 11:00am to 12:30pm and become part of our community of successful real estate agents that are making real estate a REAL and GREAT business opportunity!!! 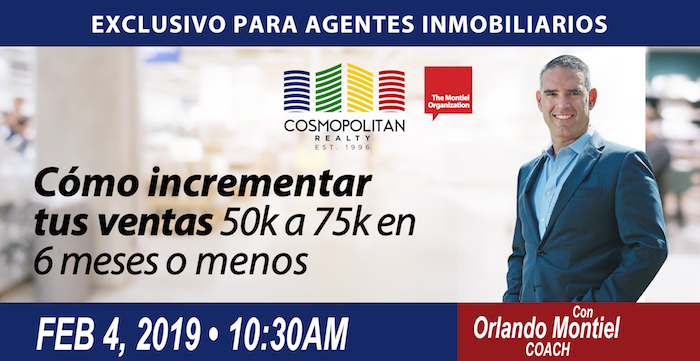 Join us Wednesday January 17th at 1801 NE 123 Street, Suite 421 Miami, Fl 33181 from 11:00am to 12:30pm and become part of our community of successful real estate agents that are making real estate a REAL and GREAT business opportunity!!! 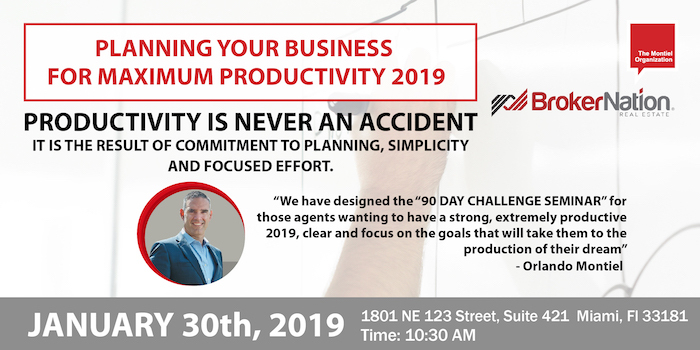 days to maximize your productivity & income. 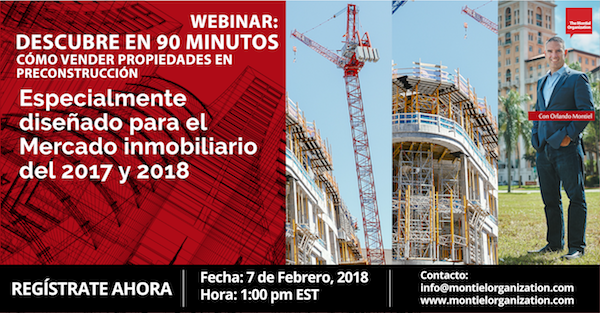 Tienes que asistir en vivo a este entrenamiento online, donde descubrirás como construir y automatizar Paso a Paso el proceso de captación y conversión!